October 23, 2010 – At 23:04c Station 2 was dispatched to the area of 941 Summer Hill Road (Wayne Township) for a possible motor vehicle accident with unknown injuries. Just as E-733 became enroute Chief 34-07 canceled all units. October 20, 2010 – At 06:44 Station 4 was dispatched along with fire district 34 (Friedensburg) to 1886 Bow Drive, Lake Wynonah for a possible structure fire. Just as Tanker 738 was about to arrive on scene, the call was canceled by Chief 722 (Sattizahn) who was in command. October 19, 2010 – At 19:14 Stations 1 & 2 were dispatched to 504 Dock St in the borough for a Carbon Monoxide Investigation. Crews arrived on scene and used gas meters to check for the presence of CO. Crews then used fans to ventilate the structure and were placed available after 30 minutes. October 15, 2010 – At 22:15 Stations 2 & 4 were dispatched to the area of 253 South Berne Street in the borough, for a reported tree down. Chief 720 (Peel) arrived on scene and found a small tree laying on the side of the road. Chief 720 held the call to Station 4 and all units were available after dragging the tree off the roadway. October 17, 2010 – At 23:13 the Schuylkill Haven Fire Department was dispatched to 62 Seven Stars Road, North Manheim Township, for an automatic fire alarm (Cotton Club). Just as units began to respond, county advised of a call back from the alarm company stating a false activation. October 16, 2010 – At 14:39 Stations 1 & 2 were dispatched to the area of 359 Center Ave for a vehicle accident with unknown injuries. Chief 735 (Kremer) arrived on scene and was met with a 2 car accident and three patients with minor injuries. Crews quickly arrived on scene and assisted EMS with the 3 patients and debris clean up. Chief 735 had command and all units were on scene until the tow company arrived. October 14, 2010 – At 4:34 Station 1 was dispatched along with Orwigsburg Fire and Landingville Fire to the area of 185 North Greenview Road, North Manheim Township for a motor vehicle accident with injuries and entrapment. Crews arrived on scene an were met with a single vehicle accident with one patient heavily entrapped. Crews from Orwigsburg and Station 1 worked for approximately 1.5 hours to free the patient. The patient was then transported to the Blue Mountain High School to meet the awaiting Medevac 7. Crews then remained on scene until the tow company arrived. Time out for all fire units was about 3 hours. October 11, 2010 – Stations 1, 2 & 4 participated in Fire Prevention Activities at Penn State Schuylkill Campus. Students were educated on the basic elements of fire safety and had a chance to view apparatus and equipment on display by the SHFD’s three companies: Rainbow, Schuylkill and Liberty. Fire personnel was also provided with a tour of the new housing facility “Nittany 5″ in-case of an emergency. The campus provided food to all those who participated as the night’s activities progressed. The Schuylkill Haven Fire Department would like to thank Penn State Schuylkill for hosting the event during fire prevention week(s). October 10, 2010 – In an article publish October 9, 2010, Liberty Fire Co.’s President was featured on the front page of the Pottsville Republican in regards to the installation of a residential sprinkler system installed in his new home. The article weighs the pros and cons about new measures leading to more sprinkler system installation in newer construction. An excerpt of the article and Mike’s comments are posted below. 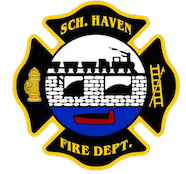 Feel free to check out the original article over at the Republican and Herald website.Mike Gossard, president of Schuylkill Haven’s Liberty Hose Company No. 4, recently built a 600-square-foot ranch home off Schuylkill Mountain Road in South Manheim Township.Despite the home being built before the Jan. 1 deadline, he decided to install a sprinkler system anyway, for a very simple reason.”Because I’m a fireman,” Gossard said in an interview Friday. “We don’t live in a place with fire hydrants. I know how difficult it is to get water up to areas that don’t have hydrants.”He said he paid $5,200 for the system. Of that, he said $1,800 went to water pumps and tanks since his home does not have access to municipal water.”If we had municipal water, it would have been cheaper,” Gossard said.Picture Courtesy of the Republican and Herald.